Miniature golf, mini-golf, or putt-putt golf is a fun family game consisting of 9 to 18 holes similar to traditional golf, but with a focus on short shots made through, around, and over obstacles that are themed in nature. Whatever the theme and whichever miniature golf spot you choose, you’ll have fun trying to beat your best score through a challenging series of holes. A great 18-hole miniature golf course is part of the War Memorial Park in Martinsburg, West Virginia. Serving the Martinsburg and Berkeley area, the park is open from Memorial Day until the end of September with the golf course is open every day from June through August. Groups get a special discount, but reservations are highly recommended. Grab a snack at the concession stand nearby. Not your typical mini golf course, Minibel Par 3 in Vienna, West Virginia has a little bit of everything for young and old alike. They offer a two-golfer package on week days and weekends for an annual fee, and during the summer months, host several different events including a golf benefit, a senior league with member fees waived, a cookout and awards at the end of the season, and night golfing with special pricing for children under 12. There’s so much to do at Grand Vue Park in Moundsville, West Virginia that you might want to take your next family vacation there. The Adventure Park has zip lines that send you over the tree tops, a ropes course, giant swing, trampoline, rock wall, and rappelling wall. There’s an aquatic center, a par 3 regular golf course, disc golfing, and a nature-themed 18-hole mini golf course. Handicap accessible. 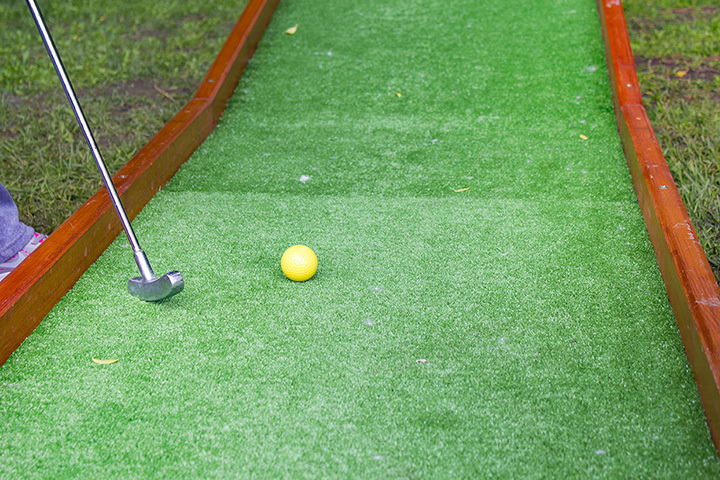 Your entire family will have fun at Putt-Putt Golf in Wheeling, West Virginia. Part of the activities available at Oglebay, home of Putt-Putt Golf Course, is an extensive playground with swings, monkey bars, and a climbing mountain. Safety is important, so a protective surface provides extra cushion for falls. Next to Schenk Lake is the miniature golf course, a family-friendly 18-hole course that will test your skill. Balls, clubs, and score cards are included in the cost. For the best place to find batting cages, baseball and softball lessons, a driving range, and miniature golf course, visit Par Four Family Entertainment in Hurricane, West Virginia. The 18-hole miniature golf course is West Virginia at its best and perfect for a family outing, birthday party, church youth group event, or office trip. A small, but fun miniature golf course that’s family friendly and easily accessible, Mountain State Miniature Golf in Beckley, West Virginia, is a nice getaway. They can host birthday parties and school outings and are open in the summer until midnight. You’ll enjoy the state history themes throughout the course with legends like Mothman and John Henry, and go mining or moonshining. Looking for a great outing for your family or with your friends? Visit Coal Country Miniature Golf in Fairmont, West Virginia for 18 holes of fun and learn a little about the state’s mining history. They also have batting cages and a snack bar to satisfy your hunger. JayDee’s Family Fun Center located in Inwood, West Virginia, is home for family fun. Activities include a water park, an arcade featuring family-friendly games for all ages like Nascar Racing and Ice Ball, Go Kart rentals, a giant jungle gym for ages one to 12, batting cages, gemstone mining, train rides, and mini golf on one of the state’s most challenging courses. The center is open year round, weather permitting, and offers specials on their website. Are you ready to become the next Tiger Woods or just looking for a great place for some family fun? The quaint little mini golf course, Clown Mini Golf in Boaz, West Virginia is open on weekends beginning in May and every day from 1:30 p.m. to 10:00 p.m. from June until Labor Day. This is the perfect place to start your golfing adventure, host your next birthday party, or business outing. As part of the City of Clarksburg, West Virginia, Riverbend Miniature Golf Course is open for family fun and adventure. No matter what your age or ability, you’ll have a ball hitting the ball at Veteran’s Memorial Park. Prices are very reasonable and special events are held during the year, like the Holiday Mini Golf event which was held last year.